The Android 5.1.1 update with the Stagefright fix (LMY48I) is now available for most of the Nexus Devices. Nexus Devices which will get this update are Nexus 4, Nexus 5, Nexus 6, Nexus 7, Nexus 9 and Nexus 10. The new OTA update is rolled out for these Nexus devices and will fix the critical security patch on the phone. If are the owner of above mention devices then you need to update your phone this official (LMY48I) OTA update to fix the Stagefright MMS vulnerability. To update your phone, go to Settings > About Phone > Software Update to see if it’s available on your network. If the OTA update is not available for you, then you can apply this update manually on your phone. The process is very simple and all you have to flash the OTA zip file on your phone with ADB commands. 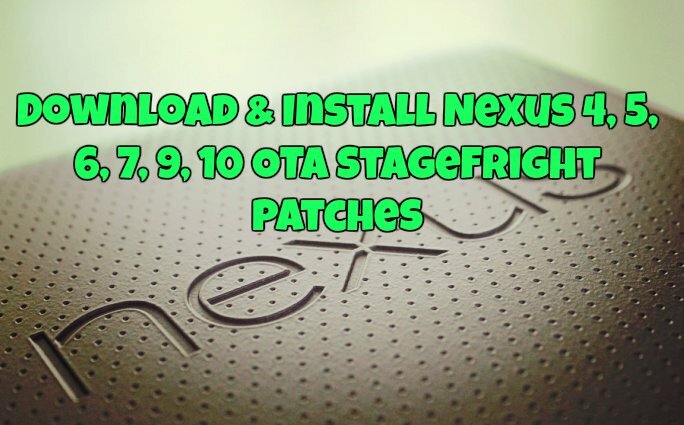 Here in this tutorial we’ll show you how to download and install the Stagefright Patches on your Nexus phones. Read all the instruction very carefully and follow the steps one by one on your Nexus. All you have to download the zip file of your Nexus Phone and save the zip file on your desktop. After that, you need to flash this file on your phone with the help of ADB commands and you are done. See our guide how to Sideload the OTA file on Nexus here.